An article recently published by CNN on how virtual reality is globally setting the bar for the latest trends in HR technology and the approach to recruiting and training made me think about my past experiences of switching jobs. I started working when I was 18, and began my career as a writer when I turned 24. During that time, I worked for four or five employers. Looking back now, I realize that on most occasions, each company’s recruitment process was pretty minimal. Once I started a position, I got barely any onboarding or training. To see how common this was, I asked my friends—all of whom work in different industries from me—about their professional experiences. Their answers were quite similar to mine. You see a post on LinkedIn or some other form of media, you apply, you wait for a call. Once you get and start the job, you’re pretty much on your own. If this rings any bell for you, it’s because that’s been the process at many companies. Sure, there are exceptions to the rule—I currently work for one of those exceptions. However, I think it’s safe to say that most of us have had lackluster recruiting and training experiences. Things, however, seem likely to change, partly because of the latest trends in HR technology. In “How VR is Transforming HR,” CNN reports that a growing number of companies are using virtual reality (VR) to recruit and train staff, with immersive experiences giving employers new ways to deliver training and foster empathy at work. The technology is also a way for companies to pick the best candidate for their team. They can assess candidates by testing them with real-life situations they would encounter in the position. The use of VR for staff training and recruitment is not yet mainstream. Nonetheless, according to the article, experts predict that it will be in the future. Other trends in HR technology could follow. 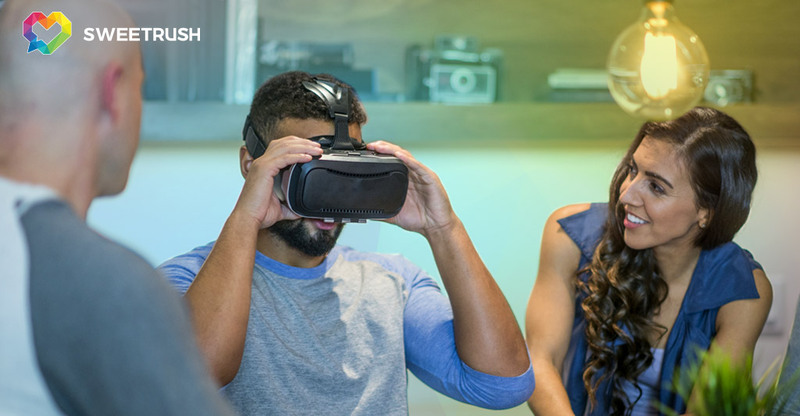 At SweetRush, we strongly believe in the power of VR—and other emerging technologies, such as augmented reality and artificial intelligence—to create more immersive and effective learning programs. The core of our mission is developing a strong learning curriculum that suits our client-partners’ needs. However, we believe these technologies are powerful tools that can greatly enhance the Learning and Development programs we create. One major advantage VR gives us is the ability to build empathy through immersion. “You can experience what it is like to be in a wheelchair, or be the minority in the room, or to do someone else’s difficult job that you never really thought about,” said Arturo Schwartzberg, Cofounder and Chairman of SweetRush, who was quoted in CNN’s article. The article tells the story of the work we did with Hilton. Together, we developed a VR experience for Hilton’s corporate team members. The program gives them a taste of the hard work their colleagues in the hotels, from the front desk to housekeeping, do every day, in order to grow empathy. “During the immersion, team members can walk through the hotel and participate in unique operational tasks, like setting up a room service tray,” said Gretchen Stroud, Vice President of Talent, Learning and Engagement at Hilton, who was also quoted. Experiences such as the ones mentioned in “How VR is Transforming HR” hint at a much brighter future for recruiting and training through the use of VR, one of the latest trends in HR technology. Read more about it in the article, and learn more about our work in VR and other emerging technologies. Pack your bags! Explore instructional design and learning trends for 2018 in this infographic. They..
SweetRush and its partner Bridgestone Americas wow the judges at the 12th annual Stevie Awards for Sales & Customer Service. SweetRush along with client Bridgestone Americas, wins in the Instructional/Training Video category. According to an in-depth article by SweetRush, providing detours in adaptive learning reduces boredom and.. The company wins top honors at the Horizon Interactive Awards 2017 for a custom 3D..